The National Institutes of Health (NIH) has retired the last federally-owned chimpanzees from a life as research subjects. This month, NIH director Francis Collins announced that the NIH will completely end all use of chimpanzees in NIH research, and that the 50 chimpanzees that had been held in reserve will be retired. This decision comes after the U.S. Fish & Wildlife Service ruled that all chimpanzees, both in the wild and in captivity, would be listed as endangered, thus making invasive research on chimpanzees possible only if scientists could prove that the research would benefit wild chimpanzees. This decision, made in June 2015, went into effect in September. Like the chimpanzees retired by the NIH in previous year, these 50 chimpanzees are slated to be moved to Chimp Haven, a federally-funded chimpanzee sanctuary that cares for chimpanzees who have been used as research subjects as well as chimpanzees who have been retired from the pet and/or entertainment industry. At the sanctuary, retired chimpanzees will be able to live in appropriate social groups and will not be confined to cages, but will be allowed to roam and climb outdoors. The Jane Goodall Institute applauds the NIH’s decision to end the practice of using chimpanzees in research and to give these 50 chimpanzees a second chance at life. 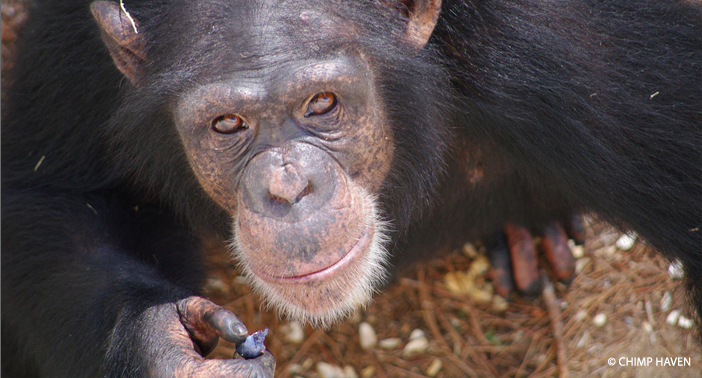 Chimpanzee populations in the wild are dwindling rapidly, and we are hopeful that the cessation of invasive research on chimpanzees will help shift the focus within the scientific community to chimpanzee conservation. Jane, how can we find the words to express how we honor you. please keep me posted on animals in Labs–I hope all animals are released!!! To all who have advocated their lifes in helping these wonderful beings. Thank you so much. My hearts rests a little easier. My essence has always been for the love of animals & have saved & nourished as many strays as I can. My heart hurts for any & all animals suffering especially induced by humans. The big game hunting , killing for “fun” is just evil. The “research ” labs that frankly so much “research” is just HYPE a way of getting other peoples money in their own banks. I believe to much of research is dragged on if you will to get more $ money $. The other issue with product companies…all should be cruelty free. Research on humans from prisons that will volunteer would be a win win for everyone. Prisoners could perhaps redeem themselves as a way of giving to the world they obviously had insulted!